“The bride was styled by James Pryce supported by Richard Ward. The bridal party was styled by the Richard Ward team. Catherine’s bridal look is called the ‘Demi-Chignon’ – an up-do style which combines a classic bridal look with a regal, couture finish. 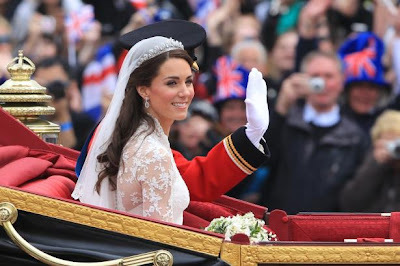 The focus of the style was Catherine’s unique and individual halo style tiara, set just back from the hairline, which determined the finished look. on her nails, kate wore essie's allure polish, a pale pink shade that perfectly complemented (but didn't upstage) her welsh gold wedding band. what did you think of the royal wedding and kate middleton's bridal beauty look? thank you to scissorboy for contributing to this story!